The office of UN Special Envoy for Syria Staffan de Mistura said in a Friday statement that evacuation of people from Darayya, a southern suburb of Damascus, must take place voluntarily. MOSCOW (Sputnik) — The statement added that de Mistura called on the United States and Russia, as the Co-Chairs of the International Syria Support Group (ISSG), as well as on other ISSG members to ensure that cessation of hostilities was in compliance with international humanitarian law and protection standards. 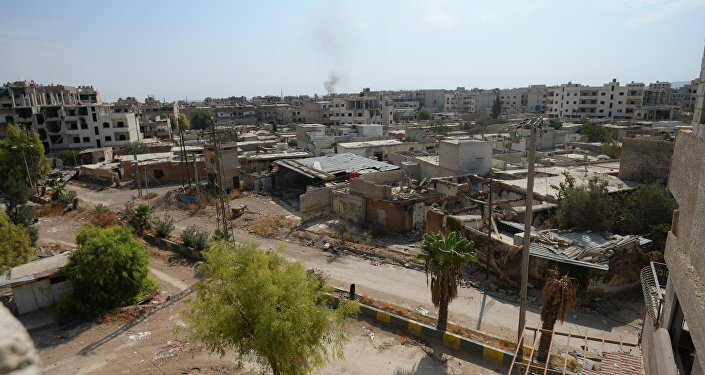 "It is imperative that people of Darayya are protected in any evacuation that takes place, and that this takes place voluntarily," the statement said. On Thursday, reports emerged claiming that the Syrian army and the so-called moderate armed opposition reached an agreement under which some 4,000 civilians must leave Darayya, as well as 700 armed militants, who will be taken to Idlib. Earlier on Friday, the Syrian authorities have begun evacuating civilians and militants from the suburb of Damascus.